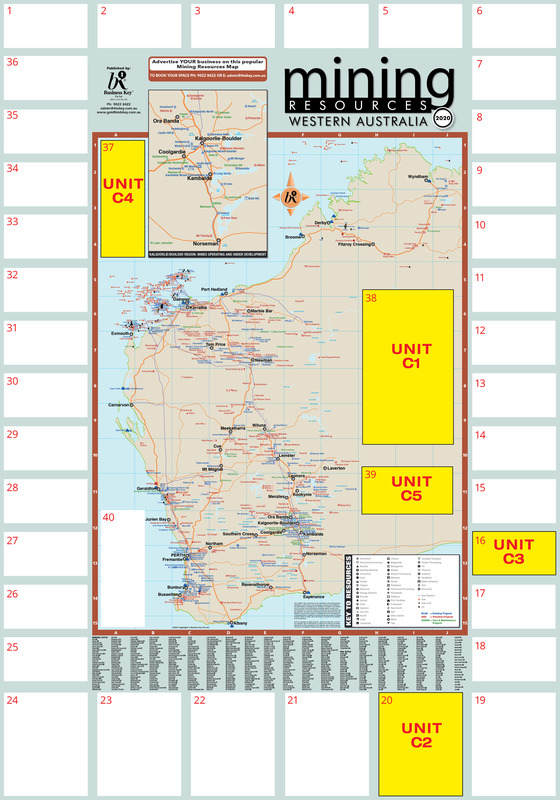 Distributed free to mining sites, company HQs and local businesses throughout the Goldfields, the WA Mining Map is a popular product. Sized at 1000mm x 700mm it's a favourite of mine site managers and executives based in Perth, Kalgoorlie and mine sites throughout WA. The map includes WA mine sites plus offshore oil and gas rigs, providing valuable information at a glance. Featuring over 40 advertising spaces, this is a unique way to present your products and services to key decision makers in the mining industry, who receive this FREE very year. Limited spaces available, so reserve your spot now! Please provide artwork as a high resolution pdf (300dpi minimum) with fonts embedded. Copyright 2018 - 2019, BusinessKey. All rights reserved.